Prosecutors raided the offices of two lawyers at the country’s top law firm Kim & Chang last month, reports revealed Monday, amid allegations that they colluded with the top court’s leadership to delay the ruling on Korean victims forced to labor by Japanese firms during Japan’s colonial rule of Korea. According to the prosecution, it carried out a search-and-seizure operation at the offices of Kwak Byung-hoon, a lawyer and former presidential secretary for legal affairs, and a lawyer surnamed Han, at Kim & Chang on Nov. 12. The investigators obtained evidence related to the litigation by the Korean victims, the prosecution said. 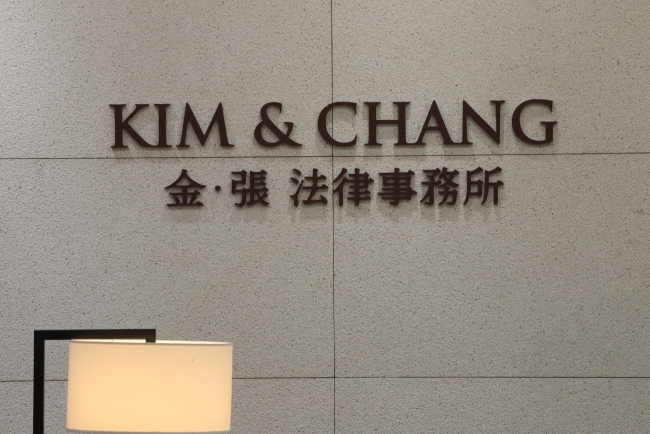 Kim & Chang represented the Japanese companies involved in the suit. It was the first-ever raid of the country’s biggest law firm by prosecutors. The prosecution is currently investigating claims of power abuse by former Supreme Court Chief Justice Yang Sung-tae and his subordinates. They allegedly influenced court rulings in exchange for favors from the Park Geun-hye administration. The two lawyers from Kim & Chang are suspected of having aided Yang’s court in deliberately delaying the top court’s ruling in the case in which Korean victims filed compensation suits against Japanese companies for forcing them to labor during the Japanese colonization of the Korean Peninsula from 1910 to 1945. The Park administration appears to have viewed the case as damaging to the country’s relationship with Japan. From 2015 to 2016, Kwak served as the presidential legal adviser to Park, who is in jail over a number of corruption charges. After serving at the presidential office, Kwak moved to the law firm. The investigators said Kwak brought together the presidential office, the National Court Administration and the Foreign Ministry while plotting to delay the ruling. On Monday, the investigators also revealed that former top court chief Yang had met Han, a judge-turned-lawyer at Kim & Chang, three times to discuss the forced labor case. On Monday, prosecutors also requested arrest warrants for two former top court chiefs, Ko Young-han and Park Byong-dae, suspected of aiding Yang in power abuse.